Alessandro di Mariano Filipepi, better known as Sandro Botticelli ("little barrel") (March 1, 1445 – May 17, 1510) was an Italian painter. He went to the Florentine school during the Early Renaissance (Quattrocento). Less than a hundred years later, Giorgio Vasari saw this movement as a "golden age". The patron of the movement was Lorenzo de' Medici. Giogio Vasari expressed this thought at the head of his Vita of Botticelli. Botticelli was born in Florence in the working-class rione of Ognissanti. At first he did an apprenticeship to become a goldsmith. Following the boy's wishes, his doting father sent him to Fra Filippo Lippi. Lippi was working on frescoing the Convent of the Carmine. Lippi's synthesis of the new control of three-dimensional forms, tender expressiveness in face and gesture, and decorative details inherited from the late Gothic style were the strongest influences on Botticelli. Another influence were the Pollaiuolo brothers.They were doing a series of Virtues for the Tribunale or meeting hall of the Mercanzia. This hall was a cloth-merchants' confraternity.Botticelli contributed to this the Fortitude, dated 1470 in the Uffizi Gallery. He was an apprentice too of Andrea del Verrocchio, where Leonardo da Vinci worked beside him, but he made his name in his local Church of Ognissanti, with a St. Augustine that successfully competed as a pendant with Domenico Ghirlandaio's Jerome on the other side "the head of the saint being expressive of profound thought and quick subtlety" (Vasari). In 1470 he opened his own independent studio.At what age did he start art? Lorenzo de' Medici was quick to employ his talent. Botticelli made consistent use of the circular tondo form and did many beautiful female nudes, according to Vasari. 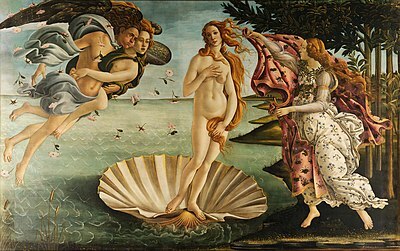 The Birth of Venus was at the Medici villa of Castello. This is a common misunderstanding. It is based on a mistake by Vasari. The painting referred to here, now in the National Gallery in London, is by the artist Botticini. Vasari confused their similar sounding names. Primavera (1478): icon of the springtime renewal of the Florentine Renaissance. The painting is also at the Medici villa at Castello, as a kind of pendant to the Birth of Venus. Left to right: Mercury, the Three Graces, Venus, Flora, Chloris, Zephyrus. Notice the Venus figure at center resembles a madonna, hence the neoplatonic fusion of pagan and Christian, but faces are real portrait: for instance, the Grace on the right side is Caterina Sforza. Though comparatively few of Botticelli's mythological paintings survive, Primavera epitmizes his use of classical mythology as vehicles to illustrate the sentiments that are actually derived from medieval courtly love. (Jean Seznec's book on the survival and new uses of pagan Antiquity in the Renaissance explores these themes.) Primavera can also be read as political allegory: Love (Amor) would be Rome ("Roma" in Italian); the three Graces Pisa, Naples and Genoa; Mercury Milan; Flora Florence; May Mantua; Cloris and Boreas Venice and Bozen-Bolzano (or Arezzo and Forlì). "The beauty of the heads in this scene is indescribable, their attitudes all different, some full-face, some in profile, some three-quarters, some bent down, and in various other ways, while the expressions of the attendants, both young and old, are greatly varied, displaying the artist's perfect mastery of his profession. Sandro further clearly shows the distinction between the suites of each of the kings. It is a marvellous work in colour, design and composition." In 1481, Pope Sixtus IV summoned him and prominent Florentine and Umbrian artists who had been summoned to fresco the walls of the Sistine Chapel. The iconological program was the supremacy of the Papacy. Sandro's contribution was moderately successful. He returned to Florence, and "being of a sophistical turn of mind, he there wrote a commentary on a portion of Dante and illustrated the Inferno which he printed, spending much time over it, and this abstension from work led to serious disorders in his living." Thus Vasari characterized the first printed Dante (1481) with Botticelli's decorations; he could not imagine that the new art of printing might occupy an artist. As for the subject, when Fra Girolamo Savonarola began to preach hellfire and damnation, the susceptible Sandro Botticelli became one of his adherents, a piagnone left painting as a worldly vanity, burned much of his own early work, fell into poverty as a result, and would have starved but for the tender support of his former patrons.